Shhhhhh. No laughing. I Are Serious Cat. 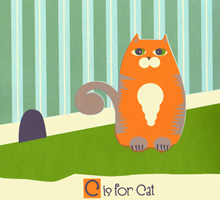 C is for Cat Alphabet Print is a great nursery & baby shower gift, as well as really sweet general: “I love you, my little kitty-cat” token of affection. 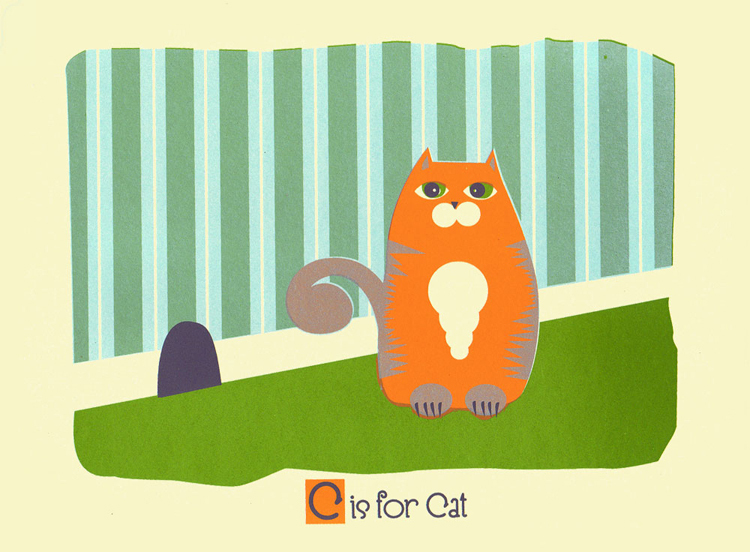 Continuing my Alphabet Print series, this is my 5-color, all hand screeprinted Kitty Kat, But, you know, spelled with a “C” like “Cat”. 5 colors from 4 screens with green, marmalade orange, transparent blue, and grey hand-mixed and non-toxic water based silkscreen inks. Edition: Open, with each print hand signed, and titled. Size: 11 x 14 inches (27.9 cm x 35.6 cm) I love the deckled edges of Stonehenge so I leave the deckle edges at the top.